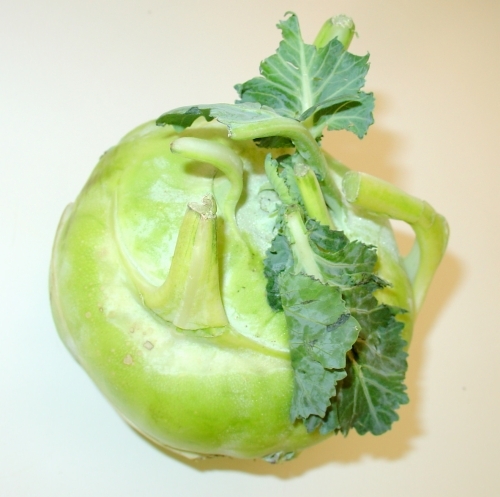 Kohlrabi is more commonly known as Noolkol in Southen part of India, often seen in Asian and Indian grocery stores in US. This pale green vegetable (turnip shaped portion) looks like a green sputnik/ bulb is a member of cabbage family which taste like fresh, crunchy broccoli stems and cabbage accented by radish. Kohlrabi is a good source of vitamin C and potassium, magnesium and copper. It is low in both sodium and calories, also is high in dietary fibers and contains the dietary minerals and folic acid .Kohlrabi can be eaten raw as well as cooked. Yogurt is widely used in South Indian cuisine. 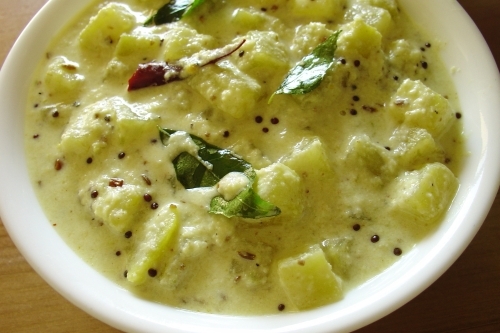 Yogurt is used as a base in making spicy stews (Majjiga Pulusu), chutneys (Perugu Pachadi) and curries. 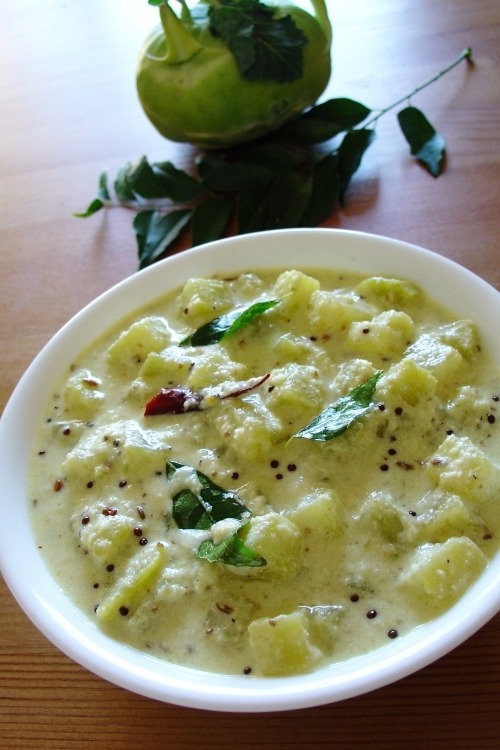 Yogurt is extensively used in Kerala, Kalan is one of the classic version of Kerala Cuisine. Kalan is also known moru curry/ thickened yogurt curry. Tradition way kalan is prepared with raw bananas and yam’s; usually made during special occasions and elaborate meals, served along with avail and other tradition dishes. Before tasting Kalan, I was thinking that it will taste similar to Avial but it didn’t. There is a difference between Kalan and Avial. Kalan is a very thick gravy curry made with particular vegetables and no tamarind is added, where as Avial is a semi-wet curry with assorted vegetables, tamarind or sour mango pieces are used in avail. Except for few common ingredients used for gravy, even the preparation method is different. Few days back I got Noolkol and wanted to make something different than the regular version my mom makes, more over my husband did not taste Noolkol before. As I was looking around Kalan recipe caught my eye. My husband loves the combination of coconut, chillies and curd, and I was very sure that he will definitely like this. Noolkol is very plain in taste; it’s really easy to infuse flavors. Kalan gravy really worked well with this vegetable, and the end result was a clean pot sitting in the sink. For me kalan tasted more creamy, peppery and spicy, avail was more like a savory dish. I got this recipe from South-Indian cookery book my sis gave me. Beat 2 cups sour curd and keep aside. Cook the cut vegetables in 2-3 cups of water in a saucepan along with turmeric powder, black pepper and salt, cook till the vegetables are done and water is evaporated. Make sure the vegetables are not overcooked and mushy. It should be ‘fork tender’, the vegetable is done. Stir in the sour curd to the cooked vegetables and let it simmer until very little yogurt remains as liquid. Now add the coconut-cumin-green chili paste to the above mixture and stir. Keep it on a low heat for 3-5 minutes. Do not let it boil or burn: remove it from the stove top. Heat oil in a frying pan on medium heat, add red chilli, mustard seeds, methi seeds and curry leaves. Allow mustard seeds to sputter and remove from heat. Pour the seasoning over the curry. You can use chilli powder instead of pepper. Let the curry sit for ½ hr or so before serving. This will help to blend the flavors. For more varieties check out Sandeepa’s, Lakshmi’s and Swapna’s blogs. i love noolcol, this is very yummy here only sometimes able to find tender ones. I remembered her when i saw the pic of it. nice version of noolkol.i never tried this.next time i am going to do this. U have always been ahead to give feed back, thanks a lot:) Give it a try when u get noolkol next time. I remember ur post on Kohlrabi. I have try ur version sometime. Thanks Sandeepa. Roopa, you can get good one’s in chinese and asian markets, I buy mine from korean market. Hey Sia ,If you love yogurt and coconut combo i’m sure you will like this curry, give it a try. Sharmi even in telugu we call noolkol. Thanks for the compliment CPG and I’m glad you enjoyed it. Lemme know how it turned out when u try swapna. Did you have the B’Day Party or is it this weekend ? Thanks you for this recipe, I liked it. I was Gooling for some information, and I landed on your blog page. And got hooked to the easy and yummy recipes! The simplicity is excellent. Thanks for having this site. if you want the kalan or moru to taste spicier, just add finely chopped ginger and a little bit of ginger powder and it will add a pleasant heat and the taste of ginger. looks fantastic! It was great to meet you at the farmers market. I’m getting giant kohlrabis in my CSA box and I’d love to make your recipe. But “2 noolkol” isn’t very specific, since they can be varying sizes. Can you tell me weight or volume measure (e.g., 2 cups) how much noolkol to use for this recipe?